In general, DSPs spend more time with the person with IDD/MI than any other professional. The competence of the DSP can make a big difference in the quality of life for people. DSPs are often the ones charged with supporting skill building. They help the person engage in recommended therapies on a day-to-day basis. This work requires an advanced level of skill and knowledge to do well. NADD has developed the NADD Competency-Based Direct Support Professional Certification Program to certify the competency of DSPs who support people with a dual diagnosis. DSP competency-based certification validates and provides assurance to individuals served, colleagues, and employers that a direct support professional has met the standards established by NADD for providing services to individuals with IDD/MI. DSPs who receive NADD DSP certification will be entitled to use "NADD-DSP" as a credential. An overview of the NADD Competency-Based Direct Support Professional Certification Program is available in the Executive Summary. 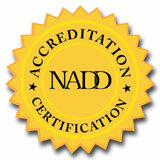 For greater detail, click on the NADD Competency-Based Clinical Certification Program Online Manual. Organizations seeking accreditation and individuals seeking Clinical or DSP certification must have NADD membership before they can apply for accreditation or certification. Individuals who work for an organization that has a NADD organizational membership are considered members for this requirement. Be sure to have your individual or organizational NADD membership number when you are completing your application. If you do not know your membership number, you may call the NADD office (800-331-5362) for assistance. To join NADD now, click here. DSP credentialing in areas other than dual diagnosis is available from the National Alliance for Direct Support Professionals (NADSP). Click here for information about their credentialing programs. If you have questions or need additional information, please contact us at info@thenadd.org.